Welcome to East Coulee and the badlands! The Red Deer River valley provides a wide range of activities well-suited to both families and working individuals. Our guest house is located in East Coulee, just 10 miles from Drumheller. East Coulee is a small, quiet community with incredible scenery and history. The unique nature in our area makes for amazing hiking, walking, and wildlife-watching opportunities. Below we’ve compiled a list of some of our favourite tourist attractions or services in our area. 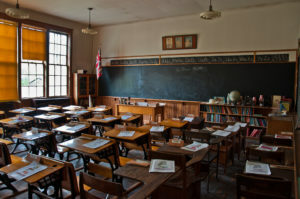 East Coulee School Museum – Restored schoolhouse with exhibits exploring the region’s coalmining past, with a cafe & gift shop. Atlas Coal Mine – The Atlas Coal Mine National Historic Site is a former coal mine in Alberta, Canada. Located in East Coulee, it is considered to be Canada’s most complete historic coal mine and is home to the country’s last standing wooden coal tipple. East Coulee SpringFest – Alberta’s best kept secret, this music festival features an eclectic mix of genres: rock, blues, jazz, alternative and more. Get ready for a weekend of dancing and grooving amid the hoodoos in a other-worldy setting in the Badlands. Caracol Clay Studio – Caracol Clay Studio and Gallery is the working studio of artist Janet Grabner and her husband John Dahm. 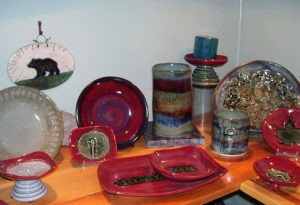 They have been creating hand built pottery in the Drumheller Valley for 20 years. Walking trails – All Trails online map features walking trails in the area. 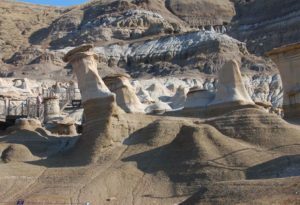 Hoodoos – The Hoodoos make a great stop on the way to the Atlas Coal Mine National Historic Site in East Coulee. Last Chance Saloon – Just a short drive from East Coulee is the tiny village of Wayne, Alberta, once a bustling coal-mining town. The Saloon is the main attraction in Wayne. The road to Wayne holds the Guinness Book of World Records title as most bridges to be found within the shortest distance: 11 bridges in just 6 kilometers! 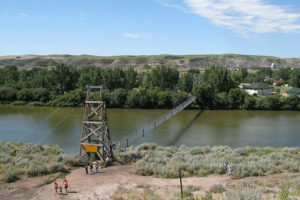 Rosedale Suspension Bridge – The Star Mine Suspension Bridge is a 117 metre long pedestrian suspension bridge which crosses the Red Deer River in Rosedale, between East Coulee and Drumheller. Travel Drumheller – This is one of Alberta’s best kept secrets and when you visit us, you will find yourself marveling at the wealth of history in the region. There are many attractions for people from all walks of life, individuals, groups and families. Travel Alberta – This page is specifically Drumheller, and lists the incredible array of things to do near Drumheller – including the world-famous Royal Tyrrell Museum and the giant dinosaurs throughout the town.